Let’s talk about shoes. They’re the hardest pieces of a travel wardrobe to get right. How do you strike a balance between shoes that are easy to pack and sufficiently comfortable for miles of walking and ones that are fashionable enough that they don’t call you out as a tourist? 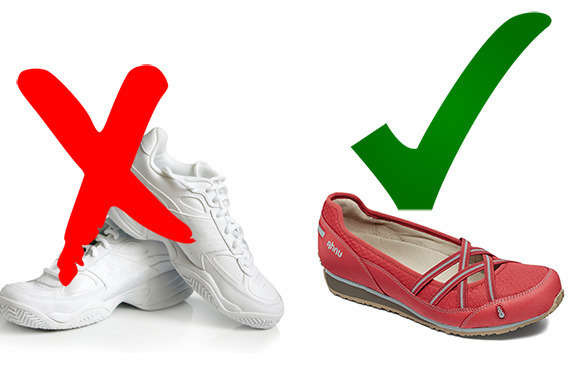 We’ll show you which shoes are the worst for travel, plus the best alternatives for men and women. Flip-flops are the ultimate vacation shoes—fun, cheap, and easy. Unfortunately, if you plan on wearing them beyond the beach or the pool, they can turn on you quite quickly. According to the American Podiatric Medical Association (APMA), flip-flops can cause major foot pain due to a lack of arch support, heel cushioning, and shock absorption. Plus, insufficient traction on the cheap rubber soles can cause slipping on wet surfaces. 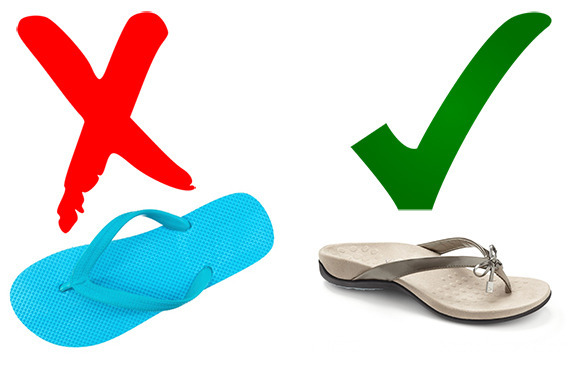 Don’t worry: You can still have the fun parts of flip-flops without the pain if you look for a pair that offers support. The APMA has given their seal of approval to our two recommendations. Alternatives for Women: FitFlop’s Lulu Thong Sandal features a biomechanist-designed midsole, which gives these sandals orthotic support. The Lulu can help reduce overpronation (which causes pain everywhere from the lower back to the knee to the foot). There’s also a patterned bottom tread to give you traction in slippery situations, a lightweight midsole to absorb shock, and a comfortable rubber footbed. Alternatives for Men: ECCO’s Men’s Yucatan Sandal offers a comfortable leather footbed and a rubber sole for traction and shock absorption. Three adjustable straps allow you to customize how the shoe fits you. The footbed is designed to inhibit bacterial growth for odor reduction. Rain boots are a perfect storm of foot problems—their moist environment can be a breeding ground for fungus and bacteria, plus heavy boots can cause foot fatigue and uncomfortable rubbing. 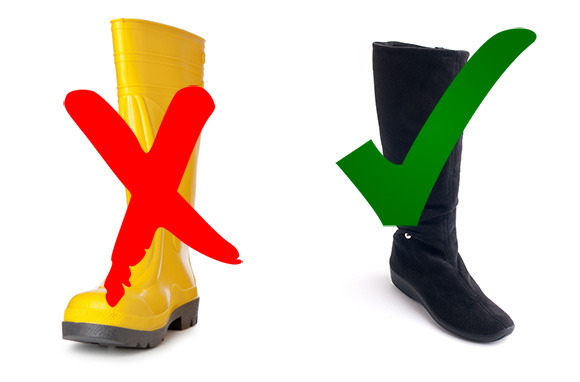 Skip the thick, non-breathable rain boots and look for regular boots that offer water resistance. Alternatives for Women: Arcopedico’s Liana boots are water resistant but still breathable. The upper is made from Lytech, and the interior lining contains the antimicrobial Sansmell deodorizing system. They’re also lightweight and flexible, perfect for maintaining your natural stride. Alternatives for Men: Sorel’s 1964 Premium T Boot has laces to keep your feet secure, as well as a felt inner lining that keeps you warm and dry down to 40 below zero. Alternatives for Women: Clarks Neenah Garden ballet flats have a cushioned insole with OrthoLite arch support and cushioning. There’s also a mini-heel to style up any travel outfit. Alternatives for Men: Okay, so men don’t generally rock ballet flats, but Clarks makes some great travel-friendly shoes for dudes, including the Reazor Edge loafer, a sleek, moccasin option that doesn’t sacrifice cushioning or comfort. The companies shilling toning shoes make such lofty promises: Wear them and get an amazing workout without doing anything extra! Unfortunately, as recent settlements have made clear, those claims are nothing but lies. As one podiatrist told the Huffington Post, toning shoes can actually hurt your feet by causing tendonitis, stress fractures, and sprains. 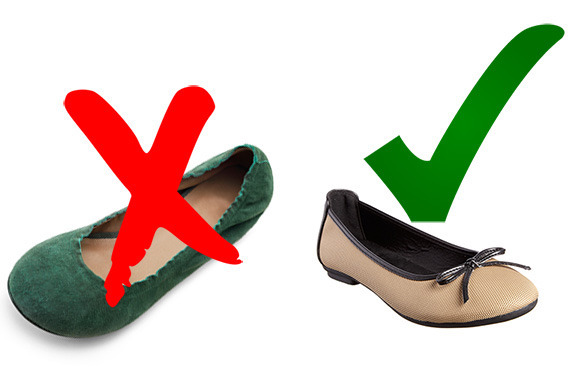 Alternatives for Women: Pick a shoe that offers all of the cushioning of a toning shoe with none of the false advertising. Ahnu’s Karma Latitude Leather Ballet Flat is a stylish alternative with a contoured midsole for lightweight support and cushioning, a cork-wrapped footbed (that’s also antimicrobial treated) to minimize odor-causing bacteria, and adjustable hook and loop straps to keep your foot secure. All Ahnu shoes use a patented neutral-positioning system called Numentum Technology, which helps promote a stable and balanced stride. Alternatives for Men: Try Ahnu’s Stockton shoe, a low, hiker-inspired casual lace shoe. It’s got a supportive arch and is made of waterproof leather. 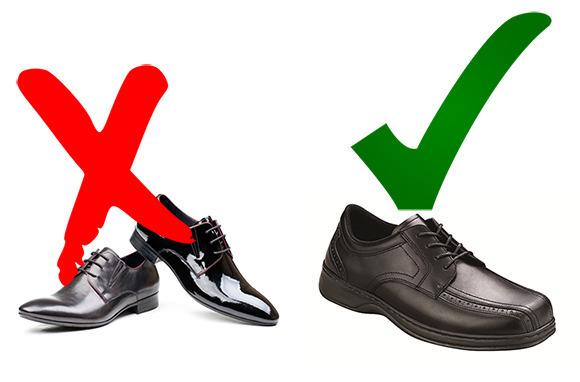 Pointed-toe dress shoes have made a fashion comeback for men and women, which is bad news for your feet. This type of footwear can put pressure on the front of your foot, causing problems like nerve pain, bunions, blisters, and hammertoes. When traveling, opt for something with a wide, rounded toe box instead. Alternatives for Women: LifeStride’s Parigi Pump has a wide toe box and a comfortable heel height. Alternatives for Men: Kenneth Cole’s Unlisted Half Time Oxfords have plenty of room in the toe, plus they come with a padded inner lining and cushioned footbed for extra comfort. Editor’s note: This story was originally published in 2015. It has been updated to reflect the most current products, pricing, and availability.